In what is arguably the game of the week in Euro football, Atletico Madrid host Juventus in the second round of games in Group A of the UEFA Champions League on Wednesday, October 1st, 2014. 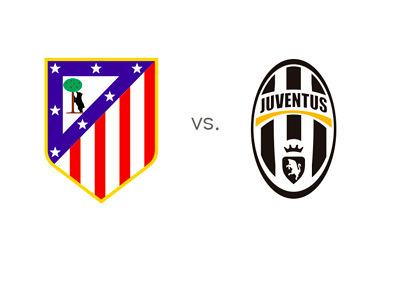 This match features the current Spanish champions vs. the current Italian champions. Atletico Madrid are in fine form, which they proved by thrashing Sevilla on the weekend with the score of 4-0. They are currently third in the Spanish La Liga tables, with four wins and one draw. The last year's UEFA Champions League finalists did lose their first group match this season vs. Olympiakos (3-2), which makes the upcoming match against Juve, a big one. Juventus are looking great this season under the leadership of their new manager Massimiliano Allegri. Juve have won all five of their Serie A games, scoring ten goals along the way and conceding none. The team goalie and captain, Gianluigi Buffon, is in excellent form and so is the team striker Carlos Tevez, who has scored six goals in the last four matches. In their opening Champions League group match, the 'Old Lady' beat Malmo FF at home with the score of 2-0. Atletico Madrid are the sizeable favourites to win this match at home. This is not an overly surprising stat as Atleti have won 17 out of their last 19 home games in UEFA competitions. On Wednesday, Juventus will be without their playmaker Andrea Pirlo, who is suffering from a hip injury and is still to play a game this season.